Google announced Chrome Browser 3D version, Google told Netizens to download .exe file and even provided .PDF file to make instant "3D" Glasses, too much. Would you believe? 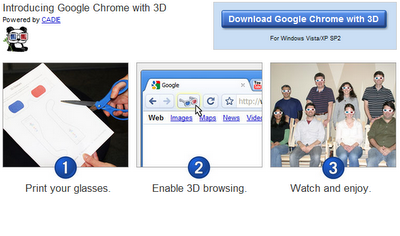 Millions of people actually downloaded the 3D Chrome and the 3D glasses on the First April 2009. Hahhaa ha haa.. Here is extreme example of cyber branding - Google announced popular Gmail that works with motion....Google told on April 01 : "Gmail Motion is a new way to control Gmail using BODY LANGUAGE ! To us Gmal Motion software, you will need a comptuer with a webcam. Google Gmail will recognize your movement with a spatial tracking algorithm. We designed the movements to be easy and intuitive to perform and consulted with top experts in kinestetics and body movement in devising them. Google's history of April 1 jokes can be traced back to the year 2000 when Google announced the launch of MentalPlex, when Google asked its users to focus on a swirling spiral and project a mental image of what they wanted to search for and the results page displayed humourous error messages. MentalPlex was followed by PigeonRank, where Google claimed that it used pigeons for its PageRank system. What is your guess? What do you think Google prank will be on this April Fool's Day ?